Cairn Terriers | Cairn Terrier Dog Characteristics, Personality, Origins, Grooming And Care. Remember The Famous Cairn "Toto" ? The Cairn Terriers originated centuries ago in the highlands and islands of Scotland and were formerly known as the Short-Haired Skye Terrier. They are counted among the same stock that contributed to the development of the Scottish and West Highland White terriers. The Cairn is a working dog and his skills are used to evict small animals and vermin from openings in rocky landmarks known as cairns - hence his name. Today, he is a mostly a popular companion and frequent dog show participant, although in Scotland he is also still used for working. Jaunty and confident, he can best be described as one of the most cute and adorable of the terrier dog breeds. This is a very lively little dog with an independent streak. 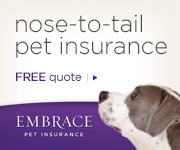 He is intelligent and easy to train if you are as consistent as your dog is tenacious. He likes having a job to do - so you might try teaching him to sniff out his toys and bring them back to the toy box, for example. He will make a good watchdog, possessing inherent traits of loyalty and fearlessness. He has the strong terrier drive to chase and dig, so make sure your property is secure around the boundaries to close off any possible escape routes. If you value your flower beds, keep a close eye on them too! Color variations: Any color except white. Often seen in Cream, Wheaten, Red and different shades of Gray. A fascinating account of this famous Cairn and her tragic beginnings, film career (a dozen movies, including the especially notable one with Judy Garland), and her happy retirement in southern California. Also, Toto offers the inside scoop on the making of The Wizard of Oz. Cairn Terriers are double-coated with a dense hard outer coat and a furry undercoat. To avoid matting, daily brushing is needed. And, to retain their Cairnish good looks, twice-yearly stripping of the coat should be done. Regular grooming will keep the Cairn clean. Cairn dogs are prone to skin problems and bathing tends to damage their coat and cause dry skin, so should only be done when absolutely necessary. Thorough grooming is the key to a beautiful appearance. Cairn dogs are very active inside the home. They are the type of dog that likes to know what's going on and will follow you around to make sure they don't miss anything! Can do well in either apartment or house. A small yard is nice to have for days when walks are not possible, and at other times to play freely and burn off some energy. Generally considered very good with children, the Cairn Terrier dog loves to play games and has an instinct to chase. As with any dog play activities involving children, it is always best to have adult supervision, no matter what the dog's reputation. A naturally loyal and enjoyable companion dog for the elderly, bearing in mind that grooming and regular activity is needed. Covers breed history and standard, selection, maintenance, breeding, grooming, showing, as well as what to expect when living with a Cairn. Cairn fanciers and newcomers alike, will find much information of interest. 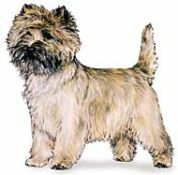 Get detailed advice on what to look for when purchasing a Cairn Terrier, as well as good information on training, health care, feeding, grooming, and a lot more. Cairn Terriers are cute, smart, and independent little dogs. Don't let them outsmart you.